This bad boy is big …very big and very bad. It’s over-the-top rich and sweet. One glance at this cheesecake will have your arteries quivering with fear and your love handles jiggling in anticipation! This cheesecake is my husband’s favourite and I make it every year for his birthday. More recently he has hinted that I should make it for Father’s Day too but I’m not sure we should be eating it more than once a year! The recipe has been adapted from a Mary Berry recipe from the book Step by Step Desserts & Confections. My only change has been to change the crust to a biscuit based one; it is easier to make and far tastier. It’s best made a day ahead and since it’s so large it is a great dinner party dessert. This many calories need to be shared around a bit. Do you have a favourite cheesecake? Line the base of a 25cm (10 inch) spring form tin. Preheat the oven to 200C (400F). Blitz the biscuits in a food processor until they are a fine crumb. Add the melted butter and stir until it resembles wet sand. Press about 1/3 or so of the crumbs onto the base of the springform tin. Bake in the oven for about 8 minutes. Allow to cool while you prepare the filling. Turn the oven up to 230C (450F). In a standing mixer beat cream cheese until soft. Slowly add sugar, scraping down the sides of the bowl frequently. Add the remaining ingredients – eggs, egg yolks, milk, flour, and lemon zest – and beat for a further 5 minutes, occasionally scraping down the sides of the bowl. Press the remaining crumbs round the side of the tin leaving a 1cm border at the top of the tin. Pour in filling. Bake cheesecake for 12 minutes at 230C (450F). Turn oven down to 150C (300F) and bake for 45 minutes. Turn off the oven and leave cheesecake in the oven for a further 30 minutes. Remove cheesecake from oven. Don’t worry if there are cracks in the top of the cheesecake; the cherry topping will cover it. Cool and chill in the refrigerator before adding the topping and serving. For the topping, drain the juice from the jar of cherries into a small saucepan; keep the cherries aside. Heat the juice with the sugar and stir until the sugar has dissolved. Allow the juice to gently boil until it has reduced in volume by about half. Remove from the heat and add the alcohol and stir. Add the sauce to the cherries and chill before serving. To serve, remove the cheesecake from the springform tin and place on a large plate. Pour over the cherries and syrup. 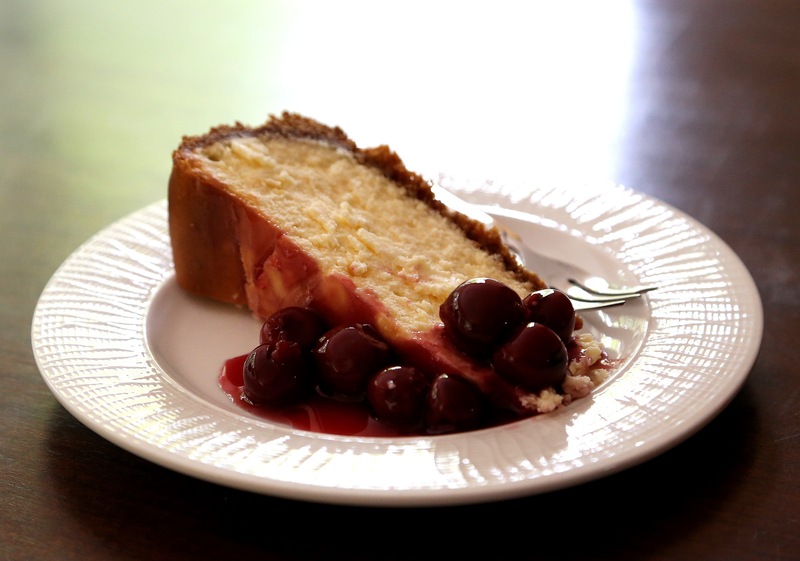 Posted in CheesecakeTagged Arnott's, cheesecake, cherries, cream cheese, dessert, food, food photography, Mary Berry, vegetarianBookmark the permalink. This looks great. I am not generally a fan of cheesecake (too rich for me) but my Mum used to make one similar which I liked as I love cherries. She added gelatin to the cherry juice and it set in top – yum! Thank you! 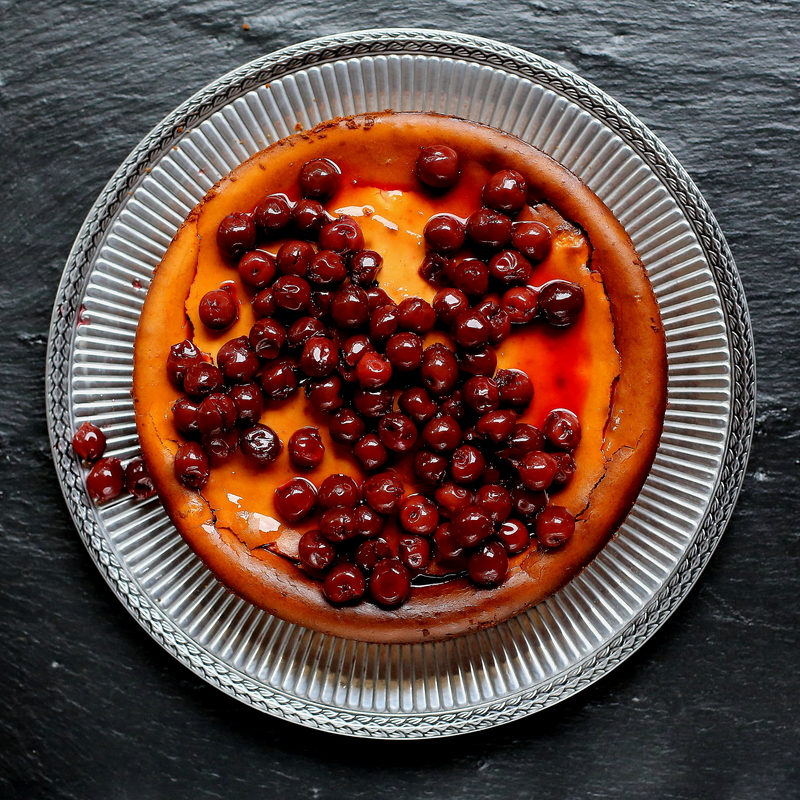 Cherries are a classic accompaniment to cheesecake. I think the tartness of the cherries is supposed to cut through the richness of the cheesecake. It would be nice to try with fresh cherries. I am not normally a cheesecake fan either but I LOVE this one. It is a crowd-pleaser and I only wish I had more birthdays each year so Stephanie would make it for me too!- it’s not as glamorous as you would think being the sister of a dessert blogger – I don’t get as many treats as you would expect! Steph is right when she says it is a big cake – great for entertaining. Thanks Gaby! I know you love this cheesecake so I can’t believe I forgot to give you an extra slice to take home on Saturday. Oh well, next time … it’s all gone now! Fyi, I only had three dainty slices. Won’t be showing it to Chris, he’ll be getting ideas for Father’s Day too!! It’s a perfect Father’s Day treat! Thank you! It’s a great combination of flavours! 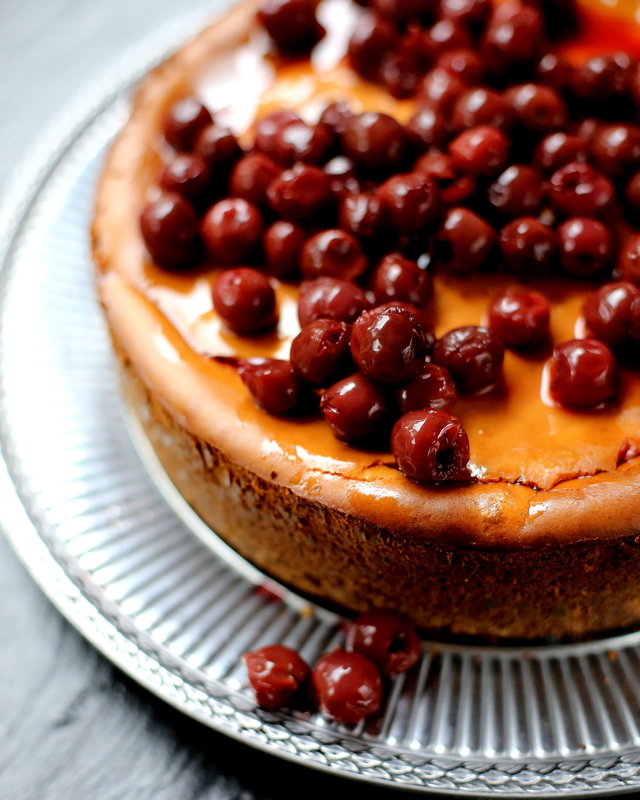 Cheesecake has always been a big cake fave of mine since I was young and yours looks wonderful, especially with those delicious looking cherries! Thank you; I think you would love this cheesecake! Gorgeous Stephanie. The cherries look so delicious!